Model No. 18040, Jumbo Flexbar, Cam-lever locking Flexbar on extra heavy, powerful on/off magnetic base. Cam-lever locking, extra heavy cable. Holds payload of 5 lbs. or more. The heavy duty FLEXBAR is completely flexible; lets you reach over, under, around, instantly and surely. Elimination of the large assortment of rods, swivels, clamps and other hardware necessary to reach and measure in obstructed areas. Cuts set-up time as much as 75% to 90%. FLEXBAR sets and locks with a simple twist of the lever. 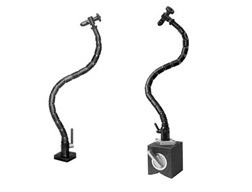 Top Mounting Clamp (“B”): (Telescopic Action) Grips objects from .125″ up to .510″ diameter. Cable and swaged fittings are stainless aircraft and Mil Spec Grade. Locked by Tensioning of Cable, incredible rigidity is achieved by this design. (No Movement once locked). Dimensions of Mag base: 2 3/4″ X 2 3/4″ X 3 1/8″.